Many exciting news happen at the church everyday. Come to this page often to see the latest. 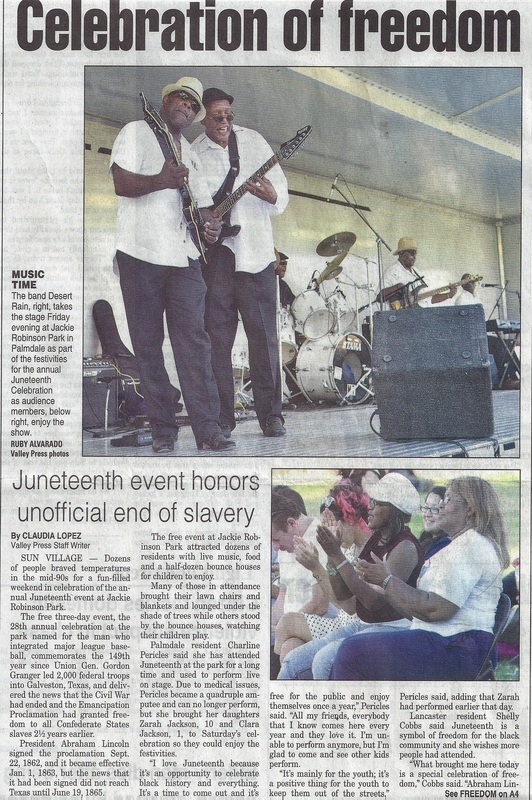 Mark Vaughn, Outreach Minister and co-founder of Love on Purpose (LOP), is featured on the front page of the June 23, 2014 issue of the Antelope Valley Press with Desert Rain band (who plays at LOP's featured Gospel Cafe at Wayside Christian Church) in recognition of the Junetenth celebration at the Jackie Robinson Park in Sun Village. Our own Sister Marie (who is seen wearing a white hat in the bottom photo) also participated with a stellar performance. Our own Sister Marlo also managed a concession stand during the festival. We proudly salute our members and thank them for their participation in our community.